A range of adventure activities and accommodation options are proposed for the Sunshine Coast. Formal paperwork for the development of a new water-themed eco-resort on the Sunshine Coast is expected to be lodged soon, as official behind the project met with Queensland Tourism Minister Kate Jones this month. Developers Sanad Capital briefed the Minister on ‘Actventure’, a brand new leisure tourism park situated on Steve Irwin Way, near the late Crocodile Hunter’s famed Australia Zoo. Designs for the park are well underway, along with discussions with management firms and operating brands and are expected to conclude before the end of 2018. Actventure is a concept which would see part of a 25 hectare site north of Brisbane developed into a leisure tourism park. Accommodations including a four-star, 225-room hotel will be constructed, with the property also set to offer conference facilities and an action sports park for guests featuring activities such as BMX, skateboarding, parkour and wave pool. In addition to the hotel, eco-villas, luxury ‘glamping’ tents and powered sites for motor homes and caravans will be constructed in response to the booming luxury camping holiday trend. Guests will have access to a host of family amenities including tennis courts, a kids club, fitness centre and mini water park. The resort will also be an active lifestyle destination for groups of all sizes. 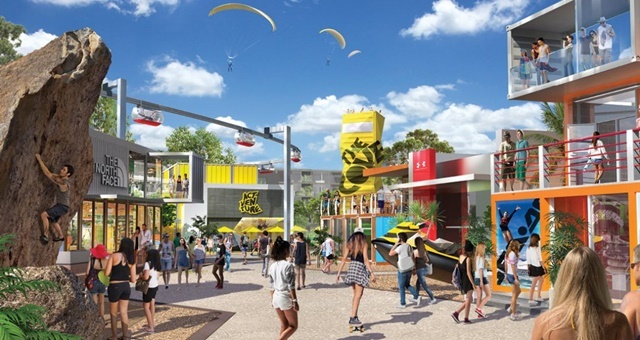 Designed around a mascot named ‘JAK’, the resort will offer a full outdoor water park and adventure activities including skateboarding, surfing, bungee jumping, zorbing, kayaking, flyboarding, segways and more. A large lawn area with space for a stage will be equipped to host concerts and community activities, while a 6,000sqm space will also be constructed for retailers and restaurants. Sanad Capital CEO Bradley Sutherland said the Queensland government’s investments into Sunshine Coast Airport and roads meant the region was in urgent need of new accommodation offerings to respond to growing demand among holidaymakers. “With the new road upgrades and new infrastructure works and the game changing international Airport in full swing and coming on board in just 24 months, we decided to implement much needed accommodation offerings with an Eco Resort at ACTVENTURE in the 1st stage, which we are creating to meet the growing holiday market demand and current trend,” Sutherland said.